In an effort to increase our understanding of the immune response to Lassa virus (LASV) and Ebola virus (EBOV), we are typing the human leukocyte antigen (HLA) genes from Lassa and Ebola patients, as well as healthy individuals. We perform HLA typing using the Illumina TruSight HLA Sequencing Panel, which allows the isolation and amplification of 11 HLA loci (Class I HLA-A, -B, -C; Class II HLA-DRB1/3/4/5, -DQA1, -DQB1, -DPA1, -DPB1) using long range PCR. Amplicons are used to produce libraries using the Illumina Nextera protocol and sequenced on the Illumina MiSeq platform. 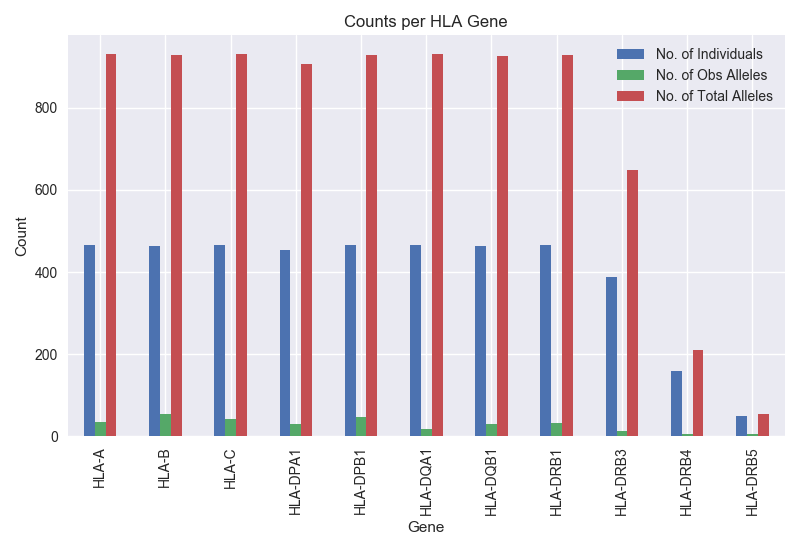 HLA-optimized software is used to analyze sequence data, produce consensus sequences and compare them to the IMGT/HLA database for HLA genotype assignments. To date, together with our collaborators at the Broad Institute we have sequenced and genotyped 253 PBMC samples from Lassa and Ebola patients as well as control samples from healthy individuals (49 Ebola, 87 Lassa and 117 control), resulting in a total of 4508 alleles sequenced (Obs_Total_alleles.csv). As groups, Ebola patients yielded 152 unique alleles, Lassa patients yielded 194 unique alleles and 212 unique alleles in the Control group (Obs_Total_alleles_grouped.csv). The Lassa dataset includes genotype data from 21 deceased patients which we have used to make preliminary comparisons with the lassa survivor group. We continue to process and genotype more individuals and we will be releasing the data here as we generate it – stay tuned. So far, the data suggest the presence of a high number of novel alleles (n=40) - that is alleles with no reference in the IMGT/HLA database (novel_alleles.csv). Eight of these are found in the Class I and 32 in the Class II HLA loci. The DQB1 and DPA1 loci have the highest numbers with 8 and 7 novel alleles, respectively. A novel allele of particular interest is the presence of a nonsynonymous mutation in the start codon (ATG to ACG) of the DPA1 loci (DPA1*03:[email protected]). 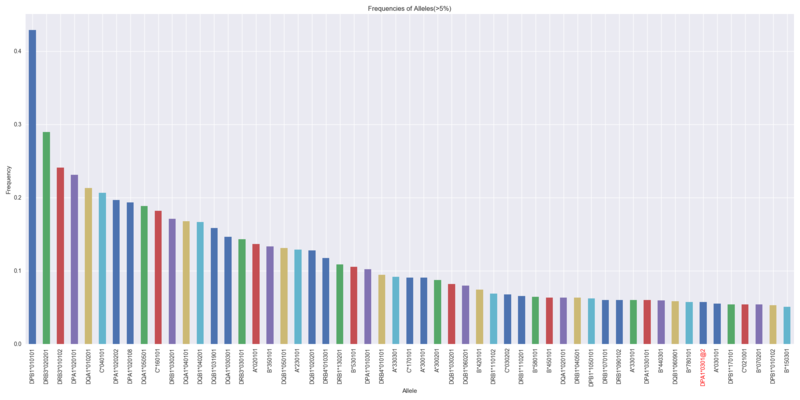 A comprehensive list of the 259 observed HLA alleles sequenced in the Lassa, Ebola and control groups (n=253) and their frequencies is presented in (allele_frequencies.csv). Thus far, the results of this project have contributed in the efforts to characterize the under-represented West African population in the IMGT/HLA database, and most importantly, these results may shed light in understanding the contribution of specific HLA genotypes in association with outcomes of hemorrhagic fever infection in the West African population. *Novel Alleles highlighted in RED.